I am always amazed that more artists don't recognize the value of a crescendo. You know what I mean: that moment when the strings swell, the vocals soar and your tummy does a little wobble that in other circumstances would be an indicator of the onset of typhoid. Adele gets it. Gary Barlow gets it. Coldplay get it, and use it to distract you from their inability to write a memorable melody. Kanye West gets it, samples it, and beats you over the head with it. The Kaiser Chiefs used to get it, but Tesco stopped delivering to their postcode in 2007. 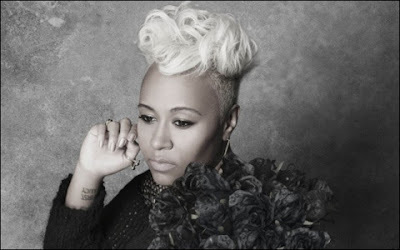 Someone else who gets it is Emeli Sandé. I was waxing lyrical about her demos just last week, and now she's gone and finished one of them. It's called Heaven, and if you've been waiting 20 years for a sequel to Massive Attack's Unfinished Sympathy, your patience has finally been rewarded. This is very, very good indeed. Heaven is released on 14th August.